Bose SoundLink Mini Bluetooth Speaker II may be small but the sound performance of the speaker is outstanding. The speaker is sleek and compact in looks. The build quality of the speaker is also amazing. Version one of Bose SoundLink Mini was indeed a big hit and this one does not disappoint either. The audio is great in every frequency base. The battery performance of the speaker is also amazing. There are no complicated control options. In fact, it is simple to use and integrate the speaker with almost all the other Bluetooth devices. The connectivity of the speaker is great. What sets this apart from other speaker options is the stellar sound. It does not really crack or distort in high range and that makes this speaker a popular choice amongst teens. There is no multipoint Bluetooth option in the speaker and it rather suffers in this range. If you compare it with other Bluetooth speakers, then there is no waterproof feature as well. However, the speaker is durable but it does not give you that weatherproof durability. You can hear your music loud and clear but there are is no stereo separation feature. Unlike the Ultimate Ears BOOM 2, the SoundLink Mini Bluetooth Speaker II is designed to work with single speaker only at a time which is again a disappointment for music lovers. 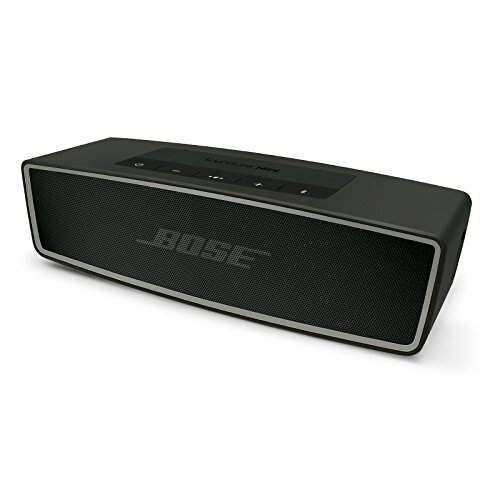 Bose SoundLink Mini Bluetooth Speaker II is purely designed for deep bass lovers. If you also want a full range of music and sound experience, then this should make it to your list. The sound is perfect in any setup and there is no leakage in its performance. With its ultra-compact size and portable feature, you can carry it anywhere you go. It’s simply perfect for all your traveling needs. It’s also perfect for those long music sessions with your friends. Play your playlist and enjoy the perfect sound every time. The speaker has voice prompts so it gives you easy access to music. It lets you talk through Bluetooth pairing and the sound is clear and crisp. You can pair this speaker with your Smartphone or your tablet. It also lets you integrate with any other Bluetooth devices to give you a great music experience. The battery performance of the speaker is good, not that great still it is good for the price. The best part about the speaker is that you can charge it while traveling too. A charging cradle is available so you can charge it whenever the battery gets drained. You can also charge the speaker with other USB sources, which is great. There are many great features of the Bose SoundLink Mini Bluetooth Speaker II, let us look at some of them. Bose SoundLink Mini Bluetooth Speaker II delivers innate sound with complete deep bass that you would look forward to from a mega-compact speaker list. It features a good build in microphone for making and taking calls through its wireless connection. The speaker has a powerful sound that delivers very high-quality audio and it has a sleek design. The speaker has a seamless connection, as there is no need to connect through wires making it portable. It’s strong and durable with aluminum body and that also makes it more sturdy. The wireless range of the speaker is good. The wireless range is up to 30 feet and it’s effective as it offers a wide outfitted area and improved signal strength. The speaker features an automatic device reminder for tracking the details of connected devices, which is again a great feature. Bose SoundLink Mini Bluetooth Speaker II has a voice prompt feature that lets you pair with other devices. It also integrates with other Bluetooth speakers to give you an amazing performance. The speaker features an auxiliary port that gives easy connectivity. The control and power options of the speaker are simple and there is no problem with the interface. The battery life of the speaker is good as it features a lithium-ion battery that gives you 10 hours of continuous playback time. The charging is also simple as it’s compatible with various devices for charging. You can customize the speaker with different soft colors and covers that are available. Bose SoundLink Mini Bluetooth Speaker II gives you enhanced sound experience that offers well-balanced sound so it actually affects the sound in an amazing way. The buttons are placed on the top for easy access. It features the power button with on and off option. It also features the Bluetooth feature button on the top so that you can access it easily. The speaker is compact in size so you can also use it while traveling. The speaker lets you connect to other MP3 sources as well. The design of the Bose SoundLink Mini Bluetooth Speaker II is similar to previous speakers by Bose. Its heavy in weight but it does not really bother if you need to carry it along with you. In fact, the speaker is designed to use outdoors. The external features are simple and there are no added controls on the top of the speaker. The pairing and power buttons are for easy access. The build quality of the speaker is quite sturdy and it scores the highest in this department. Even if you drop the speaker, there won’t be any effect to the sound, which is again good. The speaker delivers high-performance sound that stands out in every music genre. The innovative sound technology produces high-quality audio base. No doubt the bass of JBL Charge 3 is more but then with Bose SoundLink Mini II there aren’t any distortions in the mid-range of the speaker. The bass being amazing, you get a very well balanced audio performance with this speaker. The overall dynamics of the speaker are in the subtle range but can be expressive depending on your music choice. The sound is great even in the higher range. However, this also depends on the volume of the music track. Overall, the sound quality of the speaker is outstanding. The setup of Bose SoundLink Mini Bluetooth Speaker II is simple and that gives an edge to it if you compare it with other speakers in the similar range. The power options and connectivity options are on the top. You can simply play on the power button to switch the speaker on or off. The Bluetooth control lets you connect to different devices without any problem. The voice prompt feature lets you facilitate your ease of use. You can simply make calls or receive calls with voice prompt without any issue. The sound clarity is also good. It is compact and truly easy to use. Performance wise this speaker truly stands out in class. In fact, this is one of the great sounding speakers by Bose. This updated version is even better than the first option. It delivers a punching sound that gives you complete audio experience. Its compact in size, but the sound is good. It delivers a lovely balanced sound and that makes it a popular choice amongst the young generation. Even if you play heavy range songs on the speaker, the bass does not crack up. There is a balance in sound and that is the highlight feature of this good sounding speaker. Bose SoundLink Mini Bluetooth Speaker II has no issue in connectivity. It connects to all the Bluetooth and wireless devices to give you a great music experience. The range of connectivity is also good if you compare it with other compact speakers by Bose. There is an automatic device reminder feature in the speaker that maintains the details of the connected devices. The speaker offers seamless connectivity, which is great. The battery performance of the speaker is not that great but for the price, it’s good. It gives you up to 10 hours of playback time with one time recharge. You can play nonstop music without any disturbance. The battery life is ok.
Can suffer in the high range. Being tiny and compact Bose SoundLink Mini Bluetooth Speaker II gives you a great sound performance. If you compare it with the one series, then the sound quality is definitely better for the price it actually offers. It gives you a full-bodied sound performance with the great bass base. As the speaker is portable, you can easily carry it along wherever you go. So, is perfect for your traveling needs too. The only drawback of this speaker is that it does not feature multipoint Bluetooth option and this can disappoint you somewhere. The speaker is not water resistant unlike other Bluetooth speakers that are available so this is also a drawback. The battery life is good but not that amazing for the price. It’s a good choice if you are looking to buy a speaker with a decent price. The water resistant Bose SoundLink Color II would be a great choice if you want enhanced features but are willing to ignore few sound quality issues.